AirPlay Mirroring lets you mirror exactly what's on the iOS 9 iPhone/iPad screen to any Mac/PC running X-Mirage. Once mirrored to Mac/PC, you will be able to record any iOS games, app presentations, tutorials, etc. within one click. There are a growing number of users who are in need of an iOS 9 iPhone/iPad screen recorder. For example, for many iOS app testers, reproduce a bug can be a challenging process. 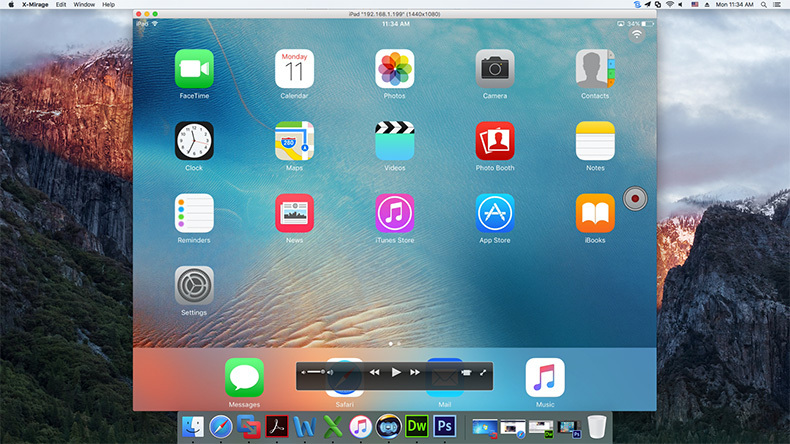 By mirroring the iPhone/iPad Screen to Mac/PC, we are making it easy for users to record iOS 9 iPhone/iPad screen. X-Mirage turns the Mac/PC to an Airplay Receiver. 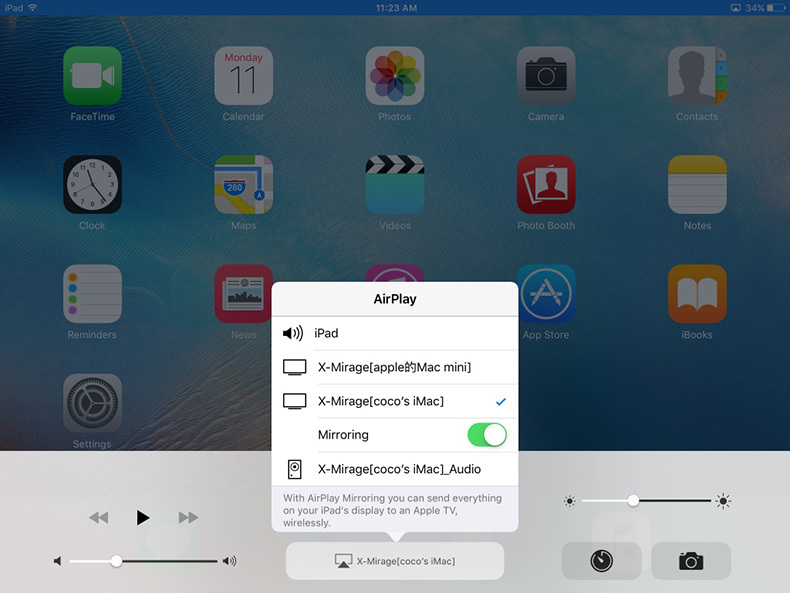 After running X-Mirage on the Mac/PC, the AirPlay Mirroring option on iOS 9 iPhone/iPad is enabled. Choose your Ma/PC from the available Airplay Receivers list, then the screen of iPhone/iPad is mirrored to the Mac/PC and the Record button appears. 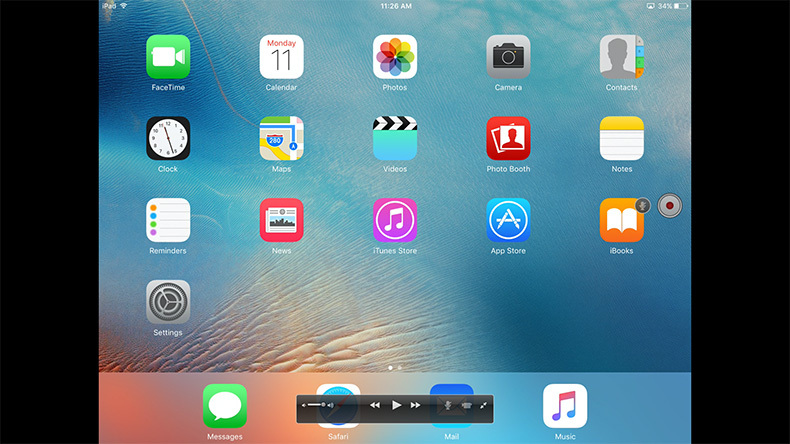 One click to record the iOS 9 iPhone/iPad screen activities to MP4 video files. The mirrored window size is changeable and full screen is supported. This iOS 9 Screen Recorder - X-Mirage for Mac, running on Mac OS X 10.6.0 and later, X-Mirage for Windows, running on Windows XP and later, is capable of recording the screen of iPad 2, iPad 3, iPad 4, iPad Air, iPad Air 2, iPad mini, iPad mini 2, iPad mini 3, iPad mini 4, iPad Pro; iPhone 4s, iPhone 5, iPhone 5S, iPhone 5S, iPhone 6, iPhone 6S, iPod touch (5th generation). X-Mirage is especially useful for teachers, developers, designers, iOS app tutorial makers, bloggers, trainers and iOS game enthusiasts to make videos. In a word, if you want to record iOS 9 iPhone/iPad screen, you can't miss it.